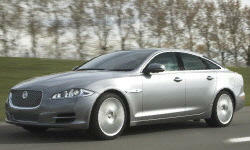 2013 Jaguar XJ Pros and Cons: Why (Not) This Car? Compared to BMW and Mercedes-Benz, Jaguar Land Rover (JLR) is a tiny company. In the U.S., JLR sells about one-seventh as many vehicles as the German companies. Exclude SUVS, and it sells only about one-fifteenth as many cars. How, then, might the Jaguar XJ compete in the large luxury sedan segment, where buyers expect the latest technology and all-around excellence? Yet compete the XJ does. In 2012 the big Jaguar sold at about one-third the rate of the segment-leading BMW 7-Series, Lexus LS, and Mercedes-Benz S-Class. Not too shabby, considering that the company as a whole is so much smaller, and that the XJ was only available with rear-wheel-drive, which tends to be a deal-killer where it snows. How did the XJ manage this? Does company founder Sir William Lyons's maxim of what defines a Jaguar--grace, pace, and space--live on? We'll check this out along with something new for 2013 in the XJ: all-wheel-drive. This comparison will include another second-tier player in the segment, the A8, since Audi is so closely identified with all-wheel-drive cars. A future review will compare the Audi A8 to the BMW 7-Series. We'll hold off on the S-Class for now, as a new one that includes many innovations is arriving soon. Why the 2013 Jaguar XJ? If you're seeking grace in the latest Jaguar XJ, its cabin is a good place to start. Massive rectilinear forms dominate the interiors of German luxury sedans. Meanwhile, inside the XJ a strip of wood trim atop the instrument panel traces an arc from door to door, bechromed round air vents lend a touch of retro sportiness, and nearly everything appears more artful. Although the tested XJ falls near the bottom of the range (you'll spend nearly twice as much to get to the top), its instrument panel is upholstered in fine leather, with French seams tracing every edge. The seats have a svelte, tailored shape, plenty of stitching, and contrasting piping. But everything inside the XJ isn't classic English automobilia. A knob for shifting the transmission motors up when the car is started. (A shame it doesn't feel as slick as it looks.) The instruments might look like traditional round gauges, but they're digitally rendered on an LCD. An interesting contrast to the interior's more traditional touches, but the virtual bezels appear clunky, and thus out of step with the pervading delicacy. Though this interior differs markedly from that of earlier XJs, its graceful spirit remains the same. Back in the mid-1980s, with the classic Jaguar XJ nearing the end of a nearly two-decade run, my father nearly bought one despite plentiful Jaguar horror stories. He loved how the car looked that much. Many people did, so Jaguar stuck with the same basic shape for over four decades. When a redesign dialed back the curves, sales suffered, and a subsequent redesign of the redesigned car adding them back. But by 2010 the original theme had run its course, the XJ looking not so much classic as tired and old. The current XJ looks nothing like any previous one. Yet its sweeping lines retain a flowing grace you won't find in the German sedans. To provide the interior space luxury sedan buyers expect, the previous generation XJ had a much taller, thicker body than its predecessors, sacrificing much of their spirit even as the basic theme was carried over. The current XJ's faster, much less formal roofline better disguises the body's height. With the Audi A8 the extended wheelbase variant seems excessive unless you'll be chauffering extraordinarily tall executives. With the Jaguar XJ, though, the long car appears much sleeker and better-proportioned than the tested, regular wheelbase one. With either wheelbase, a black applique on the rear pillar just doesn't work. From the moment I first saw it, I've wondered what Jaguar's designers were thinking. A blacked-out rear pillar should visually connect the rear window with the side window, as on the original Mercury Sable. On the XJ, the chrome trim outlining the side windows thwarts this. Also, the applique doesn't flow smoothly into the side windows along its top edge, so it wouldn't look right even if the chrome trim were removed. Two easy solutions: buy a black car or pay a body shop a few hundred dollars to paint the applique. Whether driving position belongs among the reasons to buy a Jaguar XJ depends upon one's personal taste. If you want room to stretch out, this isn't the large luxury sedan for you. A tall, wide center console robs the front seats of space, perceived even more than actual. In the car's defense, despite Sir William's maxim the original XJ was even tighter inside. "Space" had dropped out of the Jaguar formula by 1968. But this tall console when combined with the artful curves and retro touches of the instrument panel, the small diameter of the steering wheel, and the close-at-handedness of everything lends the driving position a sporty character you won't find in the Audi, BMW, or Mercedes. The XJ is a big car, but your eyes don't report "big car" like they do in the others. This sporty, tailored theme continues with the shape of the 20-way-adjustable front seats. The A8's seats have even more adjustments, yet no matter how much you fiddle with them aren't nearly as form-fitting or as cosseting. The XJ's more precisely shaped, cushy (yet not at all mushy) buckets seem much more tailored to the human form. The space between their modestly sized but firm bolsters can be adjusted to provide more lateral support when this is called for. The only noteworthy shortcoming of the XJ's front seats: though the headrests can be manually adjusted fore-and-aft, even in their most rearward position these press a bit much against the back of my head. Your physique and experience may vary. The rear seats are similarly form-fitting, but without a center console to rob space. Both the Jaguar XJ and Audi A8 aspire to out-handle the segment leaders. Which handles best? The XJ's steering is quick but very light at sub-highway speeds. Drivers seeking more heft will find it in the Audi, where steering assist can be varied among three levels, the firmest far firmer and tighter than the Jaguar's. The XJ has a dynamic mode, but its effect on the steering is small enough that it might have been my imagination. In its defense, the Jaguar's steering feels less artificial than the Audi's. Pay close attention, and it provides nearly as much feedback. Or you can just use your ears. The XJ's Pirelli P Zero Nero tires start squealing a bit early. The chassis of the two cars also behave differently. The Audi feels stable and controlled above all else. Accelerate while in a curve (generally not a good idea), and the A8 will simply power through with minimal effect on the attitude of the chassis. Oversteer isn't on the menu. The Jaguar, in comparison, has a lighter, more lively feel. This isn't entirely due to suspension tuning. Though both the Jaguar and the Audi have aluminum bodies, the British sedan weighs much less, 4,153 vs. 4,409 lbs. (LWB in both cases). Also, dipping into the all-wheel-drive XJ's throttle while turning counteracts some mild understeer and even helps it rotate, if not as dramatically as in a rear-wheel-drive car. Compared to the all-wheel-drive systems in the A8 and other competitors, the XJ's has a stronger rearward bias. The default split when accelerating is 10 percent front, 90 percent rear. Even in winter mode the default split is 30/70. In each situation the split can shift to 50/50 if the rear wheels start to slip. The default split in both the Audi and BMW is 40/60. This sporting behavior assumes you've hit the button on the XJ's center console to engage "TracDSC." Otherwise, the stability control system cuts in too early and aggressively, cutting power and forcing the car into a plow. You can disable the stability control entirely, but TracDSC strikes a good balance between fun and safety, cutting in only when it's really needed. A separate button for dynamic mode firms up the adaptive dampers, reducing a moderate amount of body roll, but the difference between modes is less obvious than in the Audi. In either car, unlike in large luxury sedans from Japan and Korea, the drivetrain mode is separtely adjustable. To bump the responsiveness of the XJ's throttle and transmission, turn the shift knob to S. As in the Audi, you won't want to engage the transmission's sport mode all the time, as it then holds a lower gear, harming fuel economy. So, both cars handle well, but differently. Which handles best depends on one's taste. I personally prefer the more graceful and dynamic character of the Jag, but do wish its steering were firmer at around-town speeds and its tires were grippier. Why Not the 2013 Jaguar XJ? The classic Jaguar XJ was renowned for its ride quality. The current car doesn't measure up. While the XJ glides down the highway, at lower speeds it shimmies and jiggles. All but the smallest bumps send tremors through the body structure. Engaging dynamic mode improves body control but modestly increases thumpiness over bumps and chuckholes. The Audi's wider range of suspension adjustability enables a more absorbant ride. But in comfort mode its suspension feels squirmy and its steering (separately adjustable) feels loose. Tremors can also be felt through its body structure. So the A8 doesn't manage a much better ride-handling balance than the XJ. Oddly enough, the BMW rides significantly better and feels considerably more substantial and solid than either the Audi or the Jaguar. The downside (for handling, not ride quality) is that it feels larger and heavier, especially compared to the Jaguar. Unlike the Audi and BMW, the XJ's infotainment system is touchscreen-based rather than knob-based. To its credit, the screen is easy to reach and a large number of audio, seat, and climate control adjustments are available. Want to cool only the seat back, and not the cushion? Want to specify different airflow as well as air temperature for the driver and passenger? Both (and much more) can be done. You can even select among three different surround sound algorithms (Meridian, Dolby Prologic, DTS) for the $2,300 20-speaker Meridian audio system. But with so many options, it can be hard (and even unsafe) to locate and then operate the one you're looking for. The learning curve is steep (though by the end of the week I was having an easier time of it). I'd especially like an easier way to channel surf on the radio. An actual knob would be welcome. The controls to heat, cool, and massage your seat are also touchscreen-only. When entering nav instructions the system responds more slowly than most. Some functions, such as changing the audio volume, bring up a small pop-up display, and until it returns whence it came nothing else can be done. Like too many others, the nav system does not display minor roads unless you zoom way in, so it cannot entirely substitute for a paper map. As mentioned when discussing the driving position, the XJ's front seat doesn't feel nearly as roomy as those in the Audi and BMW. But it also feels sportier. What's your priority? While the Audi isn't remotely the quietest car in the segment, you'll hear even more noise from the engine and the road in the Jaguar, especially on concrete. Loud? Of course not. But if you're seeking tomb-like silence, you'll be happier in the BMW or Lexus LS, or even a Hyundai Equus. There is a trade-off, of course. You'll also feel more distant from the car and the road in those cars (especially the Lexus and Hyundai). In the XJ, all-wheel-drive is only offered with the new base engine, a 340-horsepower supercharged 3.0-liter V6. Peak horsepower is not an issue. In fact, the car is so quick once the engine passes 4,500 rpm (where it undergoes a dramatic character change) that very few potential owners should feel the need for more power. Pedal to the floor, 60 mph takes about six seconds. The snarl of the wide open V6 isn't quite as sweet as that of the V8s, but it's more engaging than the quieter but also blander-sounding boosted sixes in the 333-horsepower Audi A8 3.0T and 315-horsepower BMW 740. So, what's not to love? Well, the Jaguar V6 is surprisingly loud at idle, especially if you've got a window down or are outside the car. In casual driving this engine's power delivery is less smooth and linear than the others. The A8 3.0T's engine simply pulls like a freight train from low rpm on up, with no surges or lulls. And in the 740 you accelerate quickly with little in the way of sensation. Glance at the speedometer to realize that you're already at (or well above) your target speed. On paper the Audi engine suffers a slight peak torque deficit compared to the XJ's (325 vs. 333 lb-ft), but it feels torquier. In the official specs, the Audi's lower torque peak (2,900 vs. 3,500 rpm) provides some indication of this. But I also suspect that Audi has under-rated the engine. For luxury car duty, the XJ's new V6 isn't bad. Audi's and BMW's just deliver their greater low-end shove more quietly and evenly. For performance driving, though, the more dramatic and vocal Jaguar engine has an edge. Jaguar's new V6 is more economical than the V8 it replaced in the base XJ, bumping the EPA ratings from 16 mpg city, 25 highway to 18/27. But adding all-wheel-drive knocks these ratings back down to 16/24. The Audi A8 3.0T manages 18/28, the BMW 740 xDrive 19/28. On this basis fuel economy might become a "why not." But in the real world, trip computer averages suggest that the difference is not so large. In casual suburban driving the XJ's trip computer reported averages in the low 20s. When I drove the car like I would a Prius, the trip computer reported an average of 25 mpg. Doing the same in the Audi, its trip computer reported just a few tenths more. In a 75-mph highway cruise, with the XJ's new-for-2013 eight-speed transmission loafing its engine at 1,600 rpm, the trip computer reported an average just over 30. I didn't observe highway fuel economy in the A8, but an A7 with the same powertrain and slightly less curb weight managed 28.5 in the similar driving. So, if the trip computers are equally accurate (most are about one mpg high), real-world fuel economy in the Jaguar and Audi is about the same, and quite impressive in both cases considering the cars' size, power, and all-wheel-drive traction. The BMW might have an edge over both, if only because it provides an EcoPro driving mode that makes it easier to drive the car efficiently. Jaguar has added an auto stop / start system that kills the engine when you're stopped with your foot on the brake, then instantly restarts the engine when you lift off the brake. As in BMWs, this system fails to operate transparently. When the engine cuts out it shudders in a decidedly ungraceful manner. This system can be disabled if you care more about grace than a few more tenths of a mile per gallon. Rear legroom is plentiful even in the regular wheelbase XJ. There's little practical justification for the long wheelbase car unless a rear passenger has unusually long legs. But, as mentioned when discussing exterior styling, the long XJ does look better. Compared to just about any other class of car, the Jaguar XJ's price would be a "why not." But its closest competitors cost about the same. The base price of $77,595 (including $3,500 for AWD) is a substantial $4,500 more than the Audi A8 3.0T's. Adjust for feature differences, and the gap shrinks to about $3,700. Still sizable. But few people buy these cars without options. Add the Portfolio and Visibility Packages to the Jaguar, and add the Cold Weather, Warm Weather, Convenience, and Comfort Packages plus laminated side glass and suede headliner to the Audi, and the XJ is actually $1,000 less, $82,445 vs. $83,445. Adjust for the Audi's additional features and the two emerge nearly dead even. Want the long wheelbase car? Then the XJ's base price jumps by $7,000, to $84,595, but includes much of the $4,000 Portfolio Package as standard equipment. Equipped like above, it lists for $86,245 ($3,800 more than the regular wheelbase car) while the long A8 with the above options plus a suede headliner (part of the Jaguar's Portfolio Package) and panoramic sunroof (standard on the Jaguar) lists for $85,595. Pretty close, though in this case an adjust for the Audi's additional features widens the gap to about $2,100. It would appear that Jaguar charges considerably more for the extra inches. With the BMW 740, all-wheel-drive is offered only with the long wheelbase sedan. Load up the two cars similarly, and the Jaguar is $5,750 less before adjusting for feature differences and about $4,400 less afterwards. The Lexus and especially the Hyundai would cost considerably less than any of the European sedans. But, if design or handling is a priority they're really not the same sort of car. Low-speed ride quality (or the lack of it) is a bit of an unpleasant surprise. The Jaguar XJ also doesn't provide the spaciousness or silence many large luxury sedan buyers seek. But the XJ does deliver a sportier driving experience, with lively handling and enough thrust from the V6 to endanger sales of the V8. With all-wheel-drive now an option, this handling and performance can be enjoyed in all seasons, at little cost beyond the higher purchase price. As in the past, what most distinguishes this Jaguar is its look and feel, its character. Though the new XJ looks nothing like the old one, it retains that car's artful warmth and passionate spirit. Space? Not with such a tall center console. Pace? Sure, but the others are about as quick. Grace is the XJ's secret ingredient. Jaguar and Audi each provided an insured car for a week with a tank of gas. 2013 Jaguar XJ pros and cons, according to Michael Karesh: the best reasons for buying (or not buying) the 2013 Jaguar XJ. Join TrueDelta to post your own impressions.